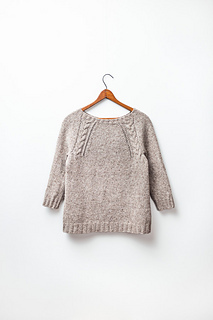 This delicate, feminine pullover bares your arms to the spring sunshine and makes an impact with a pair of bold cables with delicate eyelets along the raglan lines. But the real surprise is on the back, where an innovative arch shape turns the same cable and lace sideways and creates a reversible garment. 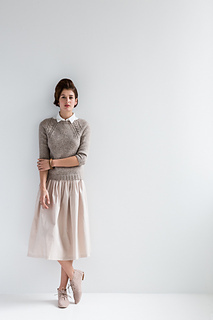 The body is worked in the round from the hem up, then divided to work the raglan yoke on one side and shaped with short rows to form the arch yoke on the other. The upper yoke and sleeves are worked in one piece from the top down, with the sleeves knit circularly, and then seamed to the body. Knit with positive ease in Shelter, Coda will let you wear a pretty frock while the weather is still chilly or dress up a casual outfit.